I'm loving our house! We have a long list of projects and lots of hopes and dreams for it, but it was so nice flying into Phoenix last night after nine days of traveling and having a home (our home!) waiting for us. 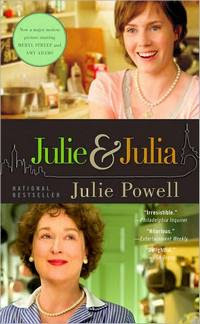 I'm loving the book Julie and Julia. We watched the film over Thanksgiving with Max's mom and sister (a perfect film for a cooking day!) and I liked it so much I picked up the book! It's nice, light, funny reading and has been perfect for all of our traveling! Finally, I'm loving my amazing husband who takes such incredible care of me! With all of the work that's already on his plate, he still finds the time to help me with mine! Not only did he organize my grade book in Excel (Excel in the bane of my existence) but he also helped me enter all of my report card grades and came into my classroom the last day before break to help with all the craziness (if you're a teacher or have ever been inside a classroom on the last day before a break, you'll understand the "craziness" comment ; ) Thanks, my hubby! 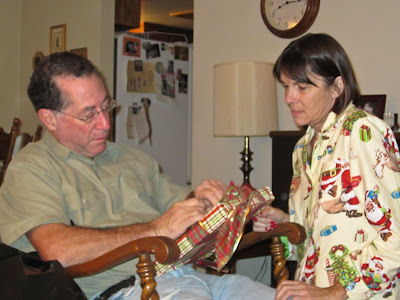 it is such a blessing to have great parents, a home, and a wonderful husband!!! Found you through WILW...I teach, too, and I fully understand the craziness of the last day before any holiday or break! I used to have my best friend come in and help me out. How sweet of your husband! I am your newest follower from WILW!!! What a great husband and I love your fish! The previous post with you and your sisters in your matching Pj's was very cute. My sisters all live in CA but it is a bit too far for us to travel. Great loves! I actually liked the book so much more then the movie! What a sweet hubby you have! I know what you mean about the craziness before a break! Yikes! I was so excited to see that another teacher brings her hubby into meet the kiddos! 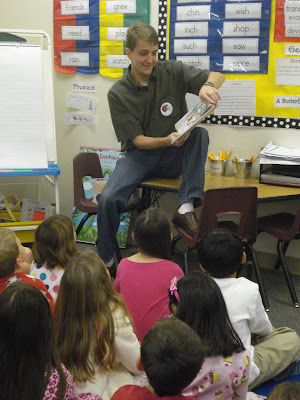 I teach 3rd grade and always have my hubby be a "mystery reader"! The kids loved it and even asked for him to come hang out for the day as their reward for filling the marble jar! Priceless! Day before Christmas is the most hectic day of the year in my classroom too! Hope you're enjoying your break.